Using a process of infallible futuristic pontification, Ulysse Nardin has decided that their undoubted expertise in painstakingly crafting impressive mechanical timepieces is, in any way, transferable to the cut-throat business of rapidly obsoleted software-heavy gadgets. 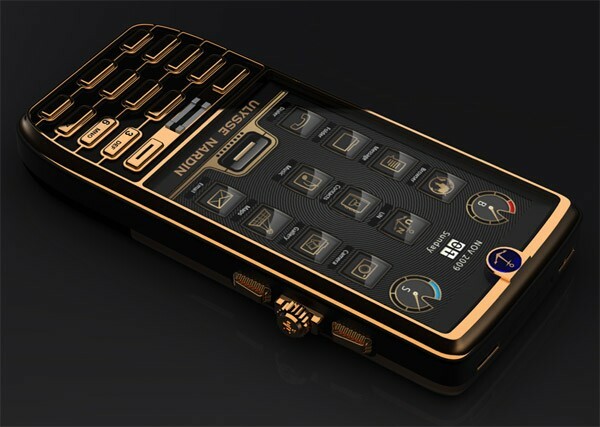 As such, they’ve added an automatic watch-winding mechanism to a gold-plated Android phone, allegedly to help charge the battery. Which will definitely work once we have phones that sip power as genteelly as, say, a fine Swiss watch. Also, they’ve put a watch crown on the side, I’m guessing to adjust the digitally displayed expensive Swiss watch that the underlying phone isn’t. So there’s that. Still, if adding durable, hand-crafted technology is an enhancement for a soon-to-be-out-of-date mobile phone, then I can’t help thinking they should have done more. For example, they could also have included an inkless Mont Blanc fountain pen for entering text, and maybe a key from a classic Bentley to lock the screen, so your servants can’t snigger at your hand-written tweets.